I know it may sound a bit odd, but I love Monday mornings. 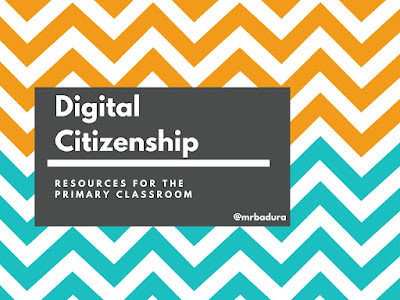 I get to start every Monday morning during the first semester talking Digital Citizenship with our 94 Kindergartners. If you are a Kindergarten teacher and you're reading this, thanks for being AWESOME! I admire you more than you will ever know. I have a hard enough time keeping these students engaged for 25 minutes, I can't imagine what it's like for 8 hours! Honestly...thank you for what you do! As we get settled into our new school years, I thought I would share some of my favorite resources that I use with our primary students here at Aurora Elementary School. I hope you find a thing or two that you can use in your classroom! Yep, it's a Parody of Goodnight Moon, the classic by Margaret Wise Brown. I read Goodnight Moon first, then head right into Goodnight iPad having students take note of all of the technology that is in the book. We then have a great conversation about if there ever is a time when we can have too much technology in our lives. The follow up to Goodnight iPad is yet another great message for our students to hear. We are all guilty of being distracted by our devices. This tale drives home that point. Our conversation after reading this book is about how we should always keep our parents in the loop when it comes to technology. Students should never be afraid to talk to their parents about something that happened online. My mom used to harp on me all the time about watching too much TV. I don't think our kids watch too much TV today, they spend too much time with their devices! After reading, we talk about the importance of taking "tech timeouts" and getting outside and playing and just being a kid. Great book with a great message! Similar to The Berenstain Bears and Too Much TV, the emphasis of this book is to unplug and enjoy the world around us! Join Hector and his friends as they embark on a trip to the local carnival and learn some valuable lessons along the way.